Mick De Giulio brings his unique vision to a line of chef-inspired kitchen sinks. Beauty follows function in this collection, finely crafted with 16-gauge stainless steel for long term durability. The Soltiere and Multiere sinks feature task-oriented, integrated accessories to facilitate food preparation and cleanup, including a plantation teak cutting board, a steel for knife honing, colander holder and flatware tray for rinsing cutlery. Both are complemented by the Bacifiore entertainment sink, in a distressed polished finish. Mick de Giulio, founder of de Giulio Kitchen Design in Chicago, has been creating kitchens for distinctive residences through the U.S. and abroad since 1984. He was named a Kitchen and Bath Design Leader by Interior Design and one of the 50 most influential people in the kitchen and bath industry over the last 50 years by Kitchen and Bath Business. The winner of numerous design awards, Mick has had work published in national and international magazines, including House Beautiful, Veranda, Interior Design, Town and Country, Traditional Home, Elle, Dolce Vita, Nile, Keukens, Domizil, Gods & Gärdar, and Architektur & Wohnen. 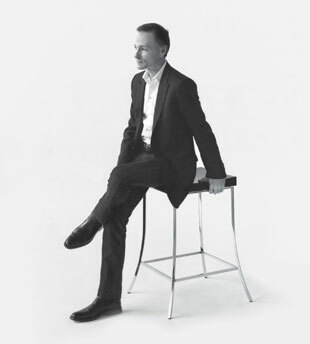 The fifth designer chosen to work with Kallista, he is well known for his creative and artistic kitchen designs.